Since the book’s been launched part of me has been eagerly awaiting responses from people but another part of me has allowed myself to ride on the wave/ vibe of my book launch and see where it takes me. I have experienced a huge rush of creativity and it feels amazing! I’ve been working on ‘Break out Break free’ which is almost formed, so I shall be emailing out invitations for the pilot workshop soon(some scribbles on this below). More recently another idea has floated in…’Dare to Dream’. Big pens for big ideas! The process by which ideas are coming in is also interesting. In addition to my conscious scribbling in ‘work hours’ there is some night-time stuff happening too! 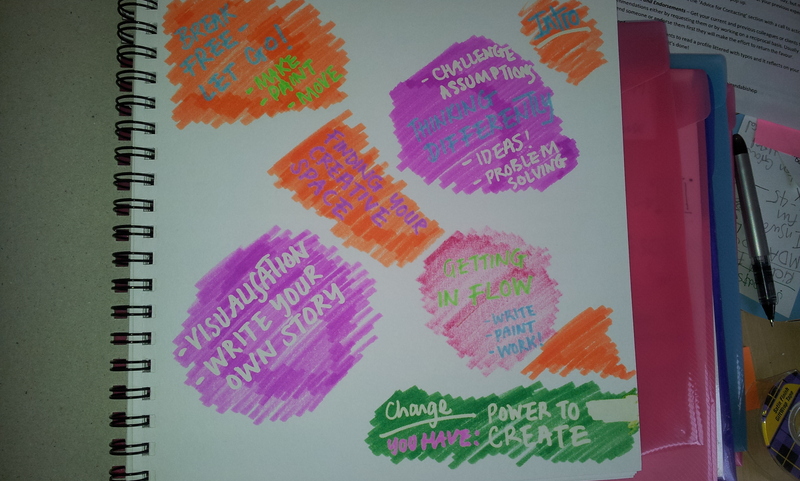 It might be the hot weather, but over the past 2 weeks I have developed a little pocket of work time, which is probably around 4-6am, where I have the most amazing thoughts, visualisations and conversations with myself. Well I did say in the book “Make the most of sleepy states” so here I am – my body and mind doing just that. Playing around with fuzzy ideas and then letting them take shape in this deeply relaxed state. I have worked on the detail of a workshop I’m doing in Brighton in October- in particular visualising the all important opening. I’ve worked on a 3 hour Dare to Dream workshop which I have also presented to a whole audience from the stage! That was a tiring night! Obviously not all my ideas are good ones, so I usually discuss them with trusted ‘Sparklers’. Dare to Dream has had 2 positive responses from people from the corporate and business world: “We never give ourselves permission to dream and it’s difficult to make time in a life which is just full of stuff to do. Having a dedicated space would be great- do it!”. So I’m going to trial this soon- Saturday morning- August 24th – in fact. Email me if you want me to post you details. Just as an inventor creates prototypes I create short pilot sessions, at a low ticket price, to test my ideas too. But some of this stuff I feel in my belly – so it has to be done! They are so exciting they need to be given a space to breathe and take shape. They may or may not work but if I run them as pilot sessions, at a super-low ticket price, then I can have fun with them and explore their potential. P.S Comments on the book welcome. This entry was tagged creativity, fuzzy ideas, pilot workshop. Bookmark the permalink.